(Newser) – The crash of Virgin Galactic's SpaceShipTwo on Friday has unsurprisingly failed to deter Richard Branson: He'll still be on his company's first flight to space, he tells CNN. "There is no way I would ask others to go on a Virgin Galactic flight if I didn't feel it was safe enough for myself," he said yesterday. Nor, he says, are those who've already bought $250,000 tickets to space giving up, CNNMoney reports. In fact, two additional passengers bought tickets on Friday, the day of the crash. 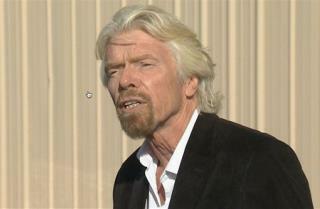 "They want to see this happen, and they want to show their commitment," Branson said. As for the flight's safety, he said it was comparable to commercial flights—on Earth—in the 1920s and 1930s. does anyone else think he looks like skeletor? These exotically fueled aircraft are not really spacecraft at all, and are not really going into space. They are simply reaching the upper reaches of the atmosphere, and returning, (hopefully). They only reach about 2500 mph, so they are totally incapable of achieving anything resembling an orbital insertion. A real spacecraft would reach orbital speed , around 20,000 mph, a far cry from even the old x15. They cannot perform any mission to an orbital platform, or satellite, much less any other use, so their argument that they are functional spacecraft is BS. Just because they go to the upper reaches of the atmosphere, doesn't make them space craft, imho. He just needs to find a pilot who doesn't make errors, or else redesign the "spaceship" so it doesn't break apart when a simple error is made.